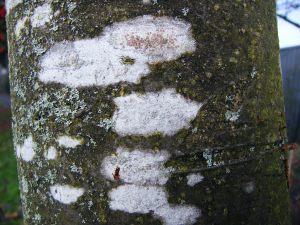 Observation - Lecanoras on Cotoneaster - UK and Ireland. Description: Lighter fruited L. albella (top left) mixed with darker fruited L. chlarotera and very pale L. carpinea. Lighter fruited L. albella (top left) mixed with darker fruited L. chlarotera and very pale L. carpinea.